I realised that I’ve been doing a lot of baking that uses very rich, heavy flavours. While I love spices, fruit, nut and chocolate, something a bit lighter can be very welcome. In Italy, they seem to recognise this, with aniseed being a very popular flavour. It’s a little bit invigorating and had a very fresh taste that is very appealing. Very different from all those mince pies! 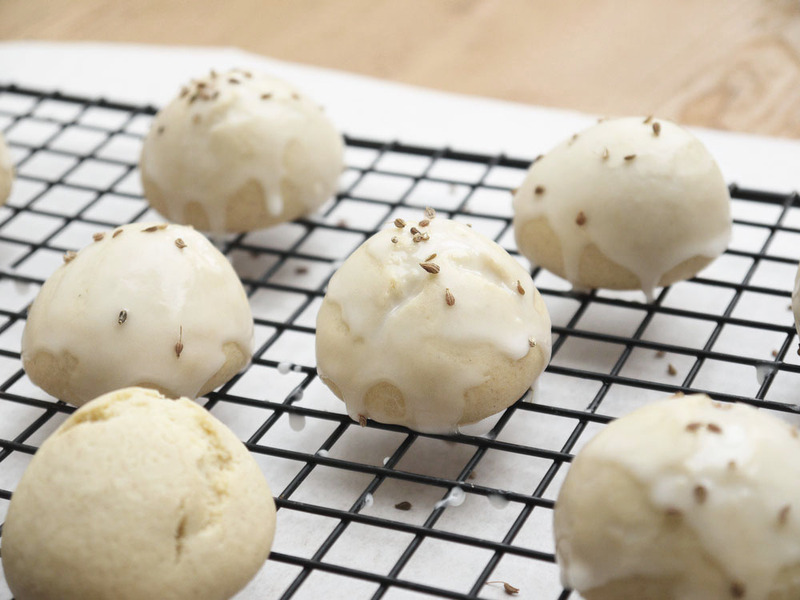 I saw literally dozens and dozens of recipes for these small, round, glazed aniseed biscuits. Probably every Italian grandmother has passed on her own recipe for these things! They seem to go by the name of both angelonies as well as genetti. From my non-scientific research, it seems angelonies are the round cookies with the brightly-coloured sprinkles, whereas genetti are similar but twisted into more elaborate shaped before being baked and glazed. If there are any Italians out there who would like to enlighten me, please do! This is a very simple recipe, and indeed the biscuits are best enjoyed while they are still very fresh, which makes it a good choice for last-minute unexpected visitors. Well, I say that it is simple, but it took me a bit of time to get a recipe that I was happy with. Yes, I perhaps try to convey an air of perfection in the kitchen, but it’s all a veneer! I have to confess that in developing this recipe, I made a complete beginners error in working out the quantities. I had seen a few recipes using milk, and for some reason added about a quarter of a cup to the mixture. Enough to send everything haywire. I first noticed something was up when I added the flour, and the mixture looked more like batter than a biscuit dough. I started adding a bit more flour, convinced that everything would come together, but no – everything stayed rather wet, then became a sticky mess. No choice for me other than to try again! The second attempt was perfect – I skipped the milk completely, reasoning that if I needed to add some, it was best to add this at the end only if needed, and in fact, I didn’t need to use any. The dough was soft without being too sticky, and it was very easy to handle. Again, a little sticky to roll into balls before baking, but nothing that I could not handle. Worth also saying that you really should add the lemon zest here – lemon and aniseed really do work very well together, I think it is the fresh and aromatic characteristics that they share. Definitely a case of the two being greater than the sum of their parts in terms of flavours! These were really easy to make, just a case of mixing up the sugar, olive oil and egg, then adding the flour and rolling into balls. The mixture was fairly sticky, so with my first failure in my mind, I did have a little doubt in my mind as to whether this second attempt was going to work. I had images of everything melting into a hard, dry cake. However, my fretting was needless – they kept their shape, then puffed up obligingly in the oven, and the kitchen was filled with the rich aroma of aniseed. Probably worth mentioning that you really do need to like aniseed if you’re going to have a go at these! Actually, if you’re not an aniseed fan, then you can swap it out for just lemon zest (or add some orange too), or go for some other spice in place of the aniseed or flavour them with rose water or vanilla. They will have a very different taste, but they should still work, but I would suggest trying to match the decoration to the flavour (slivers of candied lemon peel if you have just used the zest). Most traditional recipes seem to use coloured sprinkles to finish these cookies, and is that’s your thing, go for it. I prefer something more muted – you could go with simply white sprinkles, but I happened to have a large jar of whole aniseeds in the cupboard, so I added a few of them to the top of each cookie just after icing, which I think looked rather nice, and added an extra hit of aniseed flavour as you bite into them. I should sound one word of warning – aniseed extract can be very strong, so use it with caution. 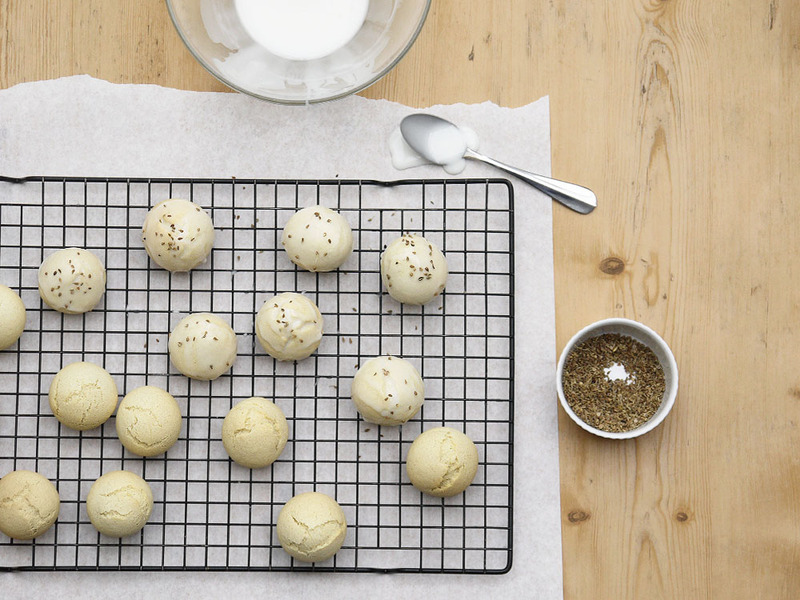 You might think you’re not adding enough, but after baking, the flavour will be quite noticeable. If you feed you have not got enough flavour in the actual dough itself, you can always add a bit to the icing to enhance it. 1. Preheat the oven to 175°C (345°F). Line a baking tray with greaseproof paper and rub lightly with a dot of olive oil. 2. In a bowl, mix the flour, salt and baking powder. Set aside. 3. In another bowl, beat the egg, olive oil and caster sugar for around 5 minutes until pale and slightly thickened. Add the aniseed extract and lemon zest, and fold in the dry ingredients. Mix well, adding more flour if needed – the dough should be soft, but you should be able to form the dough into balls with dampened hands. 4. Take teaspoons of the mixture and roll into balls. Place on the baking sheet, leaving a little space for them to expand. 5. Bake the cookies for around 12 minutes until puffed and the surface is slightly cracked, but they should not start to colour. Remove from the oven when done, and transfer to a wire tray to cool completely. 6. Finally, make the glaze – mix the icing sugar, aniseed extract and enough milk (a tablespoon at a time) to make a smooth, runny icing. Use to coat the cookies, and finish with a sprinkling of whatever takes your fancy.